New Old Stock Day Date Automatic in period display box and storage case. Also included is original Baldwin bracelet marked Bulova. Case and bracelet are all stainless. Hang tag does not have a 'name', just the model number 11654-W. By this time almost all Bulova models had lost their 'names'. A "11654-W, Day- Date," perhaps??? Hopefully it can also be matched against a particular model/series. I agree, not even close to the ad, the hang tag model number will have to do for now. Mark - if you're suggesting a name change for this watch I would ask that you follow the established protocol. 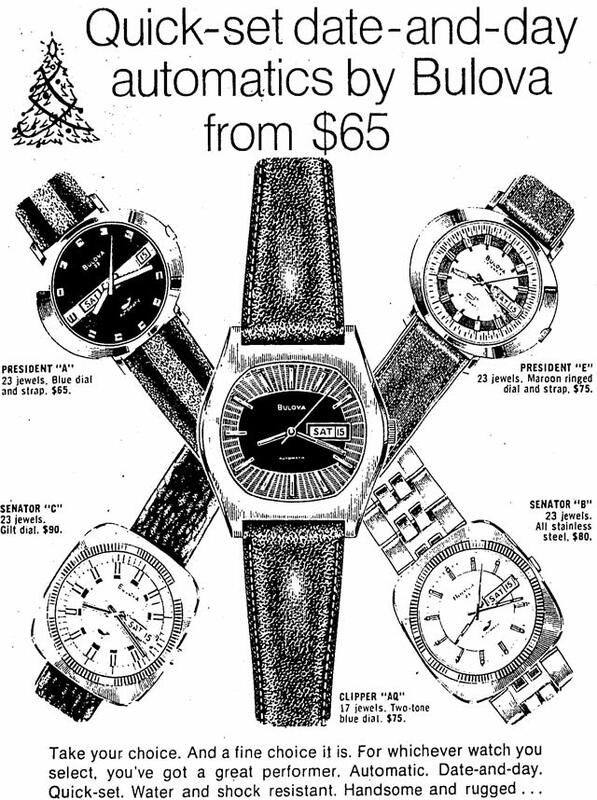 For the record this subject watch is not pictured in the ad you've posted. 2 ticks for 11654-W based on hang tag.